Hello, my name is Brian Chambers. I have an urgent message for you on behalf of Dr. Mark Stengler, America's leading naturopathic physician. And this new therapy takes chemotherapy and traditional cancer methods and MULTIPLIES their power… while taking away many of the dreadful side effects. Dr. Stengler is sharing today? Increased the 3 year survival rate for patients with stage 4 (terminal) lung cancer by an incredible 326%. For stage 3 ovarian cancer, the survival rate increased by 69%. And for patients with terminal stage 4 colon cancer, that 3 year survival rate increased by a mind-blowing 433%. With those astonishing, LIFE-SAVING results, could this therapy erase the fear of cancer once and for all? Well I’m sure you’re asking… just what is this cancer secret? Well it’s actually a specialized form of a very common nutrient you could actually find in some foods. It energizes and SUPERCHARGES your own body’s immune system in an amazing way. It turns your own white blood cells into Army Rangers… muscled-up soldiers that specifically identify and destroy cancer cells. You see, your immune system naturally produces hydrogen peroxide – yes, the very same stuff your mom puts on cuts and scrapes – to fight off invaders, like infections and malignant cells. And here’s the most important thing: hydrogen peroxide (H202) is absolute kryptonite to cancer cells. It’s like your body’s own chemotherapy – but a safe, natural version that doesn’t harm healthy cells or make you feel like death walking (the way chemo does). It’s been reported by Harvard University that hydrogen peroxide serves as a signal to your body’s immune system… telling it that there are invaders or dangerous cells. Put simply, it “marshals the troops” to fight and repel a foreign threat. In fact, thanks to hydrogen peroxide, your normal immune system regularly obliterates thousands of cancer cells long before they become deadly tumors. But cancer cells are persistent. They multiply quickly, so when a tumor does take hold, your immune system just can’t keep up. Now imagine a new supercharged immune system… one that pumps out a vastly greater amount of hydrogen peroxide to kill cancer cells. That’s exactly what ascorbate therapy – when used in the correct way – appears to do. It gives you a new superhero immune system… churning out cancer’s kryptonite, hydrogen peroxide, at an accelerated rate. In the face of this super-powered immune response, cancer cells simply don’t stand a chance. Dozens of laboratory studies have shown the potent anti-tumor properties of specialized ascorbate therapy… how it targets and kills malignant cells while leaving healthy cells untouched. The lab results show its amazing potential for stopping, reversing and even CURING cancer… but your body is NOT a petri dish. Lab results are one thing, real-life patients are quite another. Well, one of the medical centers pioneering the research on this therapy is now reporting some remarkable results on real cancer patients. Harry L., a 49-year-old restaurant manager from near Kansas City, came to the clinic with invasive stage 3 thyroid cancer, which had spread tumors all over his body. With his cancer in such an advanced stage, Harry declined to receive chemotherapy and instead chose to use the ascorbate protocol on its own. To the amazement of all involved, under the ascorbate protocol his tumors started to shrink… melting away one after another… like a blessed miracle! Estelle P., a 66-year-old retired teacher from Smyrna, Delaware, had stage 3 lymphoma and a tumor on her spine. She was also showing early symptoms of bone cancer. She refused chemotherapy, but instead followed the ascorbate protocol in conjunction with radiation. After 5 weeks of radiation, the spinal tumor remained and a new tumor appeared. She stopped using radiation but the ascorbate therapy continued… and 6 weeks later… her tumors were GONE. I’d call THAT a miracle. Catherine T., a 55-year-old nurse from North Houston, Texas, was fighting deadly stage 3 ovarian cancer. She supplemented chemotherapy and surgery with the ascorbate protocol. As of the study’s publication date, more than three years later, Catherine had NO signs of cancer. Nathalie S., 60 years old, from Fremont California, was also fighting advanced stage 3 ovarian cancer with chemotherapy and surgery. And then she began ascorbate therapy. Thirty months later, she shows no sign of cancer at all… and all her test results look normal. Just think of how joyful she must feel… and how lucky! Remember, every one of these stories was about someone fighting ADVANCED stage cancer… and every one of them used ascorbate therapy. Unfortunately, there are few large placebo-controlled studies on ascorbate therapy in humans. How can this be? After all, Dr. Stengler firmly believes this is the MOST powerful cancer therapy known to modern science. And doctors and scientists around the world have used ascorbate therapy to treat thousands of cancer patients. But it remains all but unknown in the United States. Why? The answer is shocking… Ascorbate therapy was discredited and then buried in the United States after our most prestigious hospital virtually SABOTAGED it. Let me explain. In the 1970s, ascorbate therapy was championed by none other than Dr. Linus Pauling, one of the most influential scientists of the 20th century. In fact, he won two Nobel Prizes for his work in chemistry. These astounding results quickly gained the attention of both the press and major research institutions. Was cancer finally defeated once and for all? So, the Mayo Clinic – America’s number one hospital center – conducted two studies of ascorbate therapy in terminal patients and published the results to much fanfare. They announced to the world that ascorbate therapy did NOTHING to prolong the life of cancer patients. What? The evidence found in Dr. Pauling’s studies was so conclusive… how could the Mayo Clinic – an internationally recognized research institution – get such different results? The Mayo Clinic BUNGLED the study. Their study involved giving ascorbate orally (by mouth) to terminal cancer patients. But Dr. Pauling’s research – and all accepted ascorbate therapy – involved the use of INTRAVENOUS ascorbate. Ascorbate passes quickly through the body when taken by mouth. You simply can’t build up a high enough concentration for it to be effective. But intravenous therapy is different. Two-time Nobel Prize winning chemist Dr. Pauling wrote many rebuttals of the Mayo Clinic’s findings, imploring them to test again using intravenous ascorbate. But the Mayo’s findings stuck and the chemo-pushing mainstream medical community quickly labeled ascorbate useless… or even a sham. In fact, some doctors who continued to administer this life-saving therapy were actually prosecuted by state medical boards intent on preserving traditional – and ineffective – cancer protocols. And that’s where it would have stayed if not for Dr. Stengler and a handful of other forward-thinking doctors and scientists. Dr. Stengler refused to be silenced. He’s used intravenous ascorbate therapy in his clinic for more than 15 years, with astonishing, life-altering results. He’s seen firsthand how much it improves cancer patients’ length and quality of life. But the medical mainstream continues to sleep on this breakthrough. There remains little published information on intravenous ascorbate. So Dr. Stengler has decided to take a crucial and controversial step… he’s now publishing his complete protocol for using intravenous ascorbate. Not only that, he’s including everything he’s learned in more than 20 years of fighting – and beating – cancer. He’s speaking out against the sleeping mainstream medical establishment… giving YOU everything you need to know to fight and beat cancer. straight from Dr. Stengler himself. It’s called “The Stengler Cancer-Reversing Protocol” and it’s the result of his 20+ years’ experience researching and beating cancer. “The Stengler Cancer-Reversing Protocol” is more than 100 pages long and includes everything you need to know to fight and win against our most dreaded disease. You’ll get complete details on using Dr. Stengler’s own therapies and protocols… including step-by-step instructions. He also includes exactly how to find the most powerful cancer treatments for yourself. Please, if you or your family has EVER faced or feared cancer, you must ask for his powerful new resource today. Full details on intravenous ascorbate therapy are on page 1, but Dr. Stengler didn’t stop there. He wanted this new resource to be your family’s Bible in any fight against cancer. Did you know that something called the “cloud mushroom” is a powerful treatment for esophageal, lung, colon, stomach and some other cancers? It’s true and there are over 400 published scientific studies backing up its amazing cancer-fighting abilities. It actually seems to provide people “super immunity” against cancer. And yet your doctor or oncologist likely has never even heard of it. Truth is, most mainstream doctors don’t know anything about how powerful some special medicinal mushrooms are against cancer. That’s not surprising since drug companies sponsor both the medical schools they attend and the continuing education seminars they go to. It’s one of the great conflicts of interest of our time, but it’s how our modern medical system works. And the drug companies aren’t going to invest in or promote cheap natural treatments they can’t patent. So cancer-fighting miracles like the “cloud mushroom” are completely overlooked… or even discredited. That ends today. Dr. Stengler is pulling back the curtain to reveal this natural cancer-beating wonder from God’s green earth. This Japanese scientist became interested in the mushroom and worked with his colleagues to study it. They eventually developed an extract they called PSK. But there’s more. You see, some of the people in the study had advanced stage 3 lung cancer, the kind where tumors are already spreading beyond the lungs to other parts of the body. And for those desperate souls, this little “cloud mushroom” extract was a true miracle. The 5-year survival rate for people in the study with advanced stage lung cancer increased an incredible 330%. Do you know anyone facing lung cancer? Are you realizing how much they need to know about the cloud mushroom right now? But it doesn’t stop with lung cancer. Another study looked at 111 post-surgery colon cancer patients. The rate of remission – or no evidence of cancer – in the fortunate group that got the cloud mushroom extract was more than 100% higher than those that got a placebo. When the scientists running the study tried to figure out how this little mushroom is so powerful against cancer, they found that the patients’ white blood cells – the ones that naturally fight disease – showed “remarkable enhancement in their activities”. That’s a scientist’s way of saying these patients’ own immune systems were supercharged… with cancer-killing white blood cells that were racing around destroying cancer cells and shrinking tumors. Here’s the plain truth: If you are fighting cancer, you must use this powerful mushroom extract in conjunction with ANY therapy your doctors recommend. That’s why Dr. Stengler included a full section in “The Stengler Cancer-Reversing Protocol” specifically on the cloud mushroom. You’ll find out what it is, how it works… and, most importantly, he tells you exactly how to get it for yourself. Every detail you need is on page 13 of “The Stengler Cancer-Reversing Protocol”. With the announcement of the release of his ascorbate protocol and full details on the cloud mushroom, you will have the two most powerful natural cancer cures Dr. Stengler has found in his 20+ years of research and practice. But Dr. Stengler wants to make sure “The Stengler Cancer-Reversing Protocol” is the only resource you’ll ever need to fight, reverse and even beat cancer naturally. So he’s including BONUS research reports – interpreted and written in plain English by Dr. Stengler himself – on two additional cancer-fighting therapies. A “fermented” form of a common food ingredient has been shown to have powerful anti-cancer effects against colorectal, skin, breast, lung and oral cancers. A second cancer breakthrough may come from an Asian food. This food has been found to contain an ingredient that scientists are now saying may be the key to suppressing inflammation – which is the root of essentially ALL disease, including deadly cancers. The exciting details are on page 87 of “The Stengler Cancer-Reversing Protocol” – including how this ingredient may also stimulate cancer cell death and stop the spread of tumors. Of course, Dr. Stengler includes full dosage information so you know exactly what to tell your doctor. 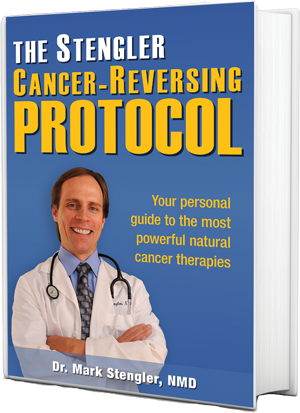 “The Stengler Cancer-Reversing Protocol” is 107 pages packed with Dr. Stengler’s own secrets for beating and reversing cancer. He’s seen them work time and again… and he’s now making them available to supporters like you. If you or a loved one has ever feared cancer, this is the one resource you must have on your bookshelf. You’ll keep it at the ready and you’ll share your secrets with family, friends and neighbors. When you receive your personal copy of “The Stengler Cancer-Reversing Protocol,” open it immediately and start reading. If you’re not convinced it’s the most important resource you own, just return it and we’ll gladly refund you your full purchase price, no questions asked. There’s no fine print on that offer and it never expires… you’re happy or you get your money back. It’s that simple. But I must warn you, we expect demand for Dr. Stengler’s new resource to be overwhelming. While we will do everything in our power to make sure we reserve a copy for you, the only way to be sure is to RSVP right now. And before you go, there’s one final thing Dr. Stengler has asked me to share with you today. Those 5 things could be threatening your life right now… turning healthy cells into deformed, mutated cancer cells. They could be spreading and multiplying… unless you stop doing these 5 things immediately. It’s called “The 5 Things You Must Know to Prevent Cancer Today” and it’s a free bonus available for new orders. We will conveniently bind your free bonus report in with your copy of “The Stengler Cancer-Reversing Protocol” (it starts on page 93). I recommend you flip to your free bonus report first when you receive it in your mailbox. And when you do, you’ll find that Dr. Stengler is making his life-saving resource available today at a special introductory price. At $39.95, the regular price of “The Stengler Cancer-Reversing Protocol” is an absolute bargain for the life-saving information it contains on every blessed page. But Dr. Stengler believes this new information is too important not to make available to as many like-minded supporters as possible… people like you. That’s half-price for all of Dr. Stengler’s brand-new cancer-defeating protocols and cancer-preventing advice. It’s the same life-saving information you would get if you visited Dr. Stengler at his world-renowned California clinic, but condensed into one easy-to-read book. However, this is an introductory offer only and our copies are limited, so please do RSVP now. When you click the button at the bottom of this page, your exclusive coupon code “CureCancer2014” will be automatically applied to your order. You don’t have to do a thing and your special 50% discount will show on the order form. However, this introductory offer and your coupon code are available ONLY through this report today. I’m afraid “The Stengler Cancer-Reversing Protocol” is not sold in stores. Remember, your copy of “The Stengler Cancer-Reversing Protocol” is covered by Dr. Stengler’s exclusive 100% Guarantee. If you aren’t completely satisfied, just return your copy for a full refund of the purchase price, no questions asked. …and so very much more. It’s Dr. Mark Stengler’s most complete cancer-defeating resource and it’s available now, but only through this report. Please do click the button below to RSVP for your own copy – and your exclusive 50% discount. When you receive it, open it immediately and start relishing the feeling that your fear of cancer is subsiding… melting away… and you are left with only hope for a bright, healthy future. P.S. Please click below now to secure your own risk-free copy of “The Stengler Cancer-Reversing Protocol” and free bonus report “The 5 Things You Must Know to Prevent Cancer Today” at your introductory 50% discount. Remember, your satisfaction is fully guaranteed.